It’s June, and in the life of your church that probably means weddings! A wedding may be big or small, plain or fancy, but trimming the ends of the pews in your church is always a special way to recognize the joyous event. Brides are probably looking to Pinterest (Wanda Martin has a great board), bridal magazines, and Martha Stewart for ideas, but you can help connect their dreams with reality. Use ribbons or tulle to make large bows with long tails and attach them to the pew ends. Multi-loop bows or simple bows — both look festive! Flowers are the traditional choice. Create nosegays or small bouquets and hang them from the ends of the pews or combine them with bows and ribbons. An old style that is making a big comeback! Roll pretty paper, stiff fabric, even burlap into cone shapes and hang them from the pew ends with ribbon. Fill the cones with flowers, herbs, sparklers, or feathers. 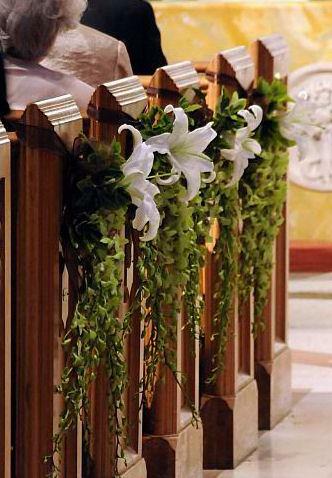 Garlands of flowers, ivy, tulle, or ribbon look sweet looped from pew to pew. Just make sure you leave room for people to enter the pews on the other side! Pink and blue are always popular, and some bridges this season are using bold colors like aqua and tangerine. For weddings being held at your church, help brides see how their special colors will look with your carpet and pew upholstery — before they get too attached. Aqua and tangerine may not have the same effect in your burgundy-decked church as they did when the bride saw them on Pinterest. Many churches have a wedding coordinator. If your church doesn’t, you may need to find a volunteer to help brides determine the best way to attach their pew decorations without damaging your pews. Plastic pew clips may be perfect for your pews. Alternatives include elastic bands, loops of ribbon, or temporary adhesives like wax or putty. If you are considering temporary adhesives, be smart and try them on a hidden area of the pew first. A spot inside the leg of the pew, for example, or at the edge of the seat may be finished in the same way as the pew ends, but won’t be as visible. Leave the adhesive on the test spot overnight and see how easy it is to remove and whether it leaves a mark.